Two women making a silent journey by foot across New York State propel this unusual novel toward an explosive ending. Ruth - mysteriously mute - appears to her pregnant niece Cora after years away and beckons her toward an unknown destination. Dual narratives move between the past when Ruth and Nat, inseparable foster children, are used as scam artists and the present, when Ruth’s silent force pulls Cora with her. Ambitious plotting is effectively used in this novel that is part road trip, part Gothic, part ghost story. In an ingeniously structured dual narrative, two separate timelines move toward the same point of crisis. Their merging will upend and reinvent the whole. A subversive ghost story that is carefully plotted and elegantly constructed, Mr. Splitfoot will set your heart racing and your brain churning. Mysteries abound, criminals roam free, utopian communities show their age, the mundane world intrudes on the supernatural and vice versa. Making good on the extraordinary acclaim for her previous books, Samantha Hunt continues to be “dazzling” (Vanity Fair) and to deliver fiction that is “daring and delicious” (Chicago Tribune). Samantha Hunt’s novel about Nikola Tesla, The Invention of Everything Else was a finalist for the Orange Prize and winner of the Bard Fiction Prize. Her first novel, The Seas, a twisted tale of mermaids, won the National Book Foundation’s Five under Thirty-five prize. She lives in upstate New York. One of TimeOut New York's "15 Best Books of 2016"
One of Esquire's "The 25 Best Books of 2016 (So Far)"
One of Refinery 29's "The Best Books Of 2016 So Far"
One of Paste Magazine's "The 16 Best Fiction Books of 2016 (So Far)"
One of Huffington Post's "5 Hot Books"
Featured on iBooks's "25 Best Books of January"
One of Read It Forward's "Favorite Reads of January"
"The ghosts of industrial America haunt the author’s picaresque third novel alongside the maybe-supernatural kind. Deep in upstate New York, two orphaned teens break free of the shady Love of Christ! foster home and make a business of claiming to channel the dead; years later, one of them, Ruth, turns up mute and gaunt at the home of her pregnant niece and draws her into a mysterious march along the Erie Canal. The two narratives alternate suspensefully, building a world of hidden forces and untethered souls that feels like the dystopia we already live in. "—Vulture, "7 Books You Need to Read This January"
"If you're looking for one of those books that's an escapist adventure, a gothic page-turner that is also so finely crafted that you'll feel enriched as well as transported for having read it, try Mr.Splitfoot. The novel features two intertwining storylines, beginning with the education of two orphans who learn to interact with the dead, and relocating decades later when one of those orphans comes to find her niece and bring her on a mysterious journey. Samantha Hunt's prose sparkles whether she's writing about the most mystical of moments deep in a seance, or the more mundane times when niece and aunt stay slog through upstate New York as they set out for who-knows-where. The way the narratives ultimately come together is unsettling yet satisfying that the novel practically begs to be called 'haunting. '"—Esquire, "The 25 Best Books of 2016 (So Far)"
"Turn to any page of this one-of-a-kind Gothic fiction about motherhood and hauntings—literal and metaphorical—and you'll come upon moments of startling originality...Hunt is scary good. "—O, The Oprah Magazine, "10 Favorite Books of 2016"
"Zombies are out, ghosts are in. [Hunt] taps into the cultural zeitgeist with a new novel blurring the natural and supernatural. "—Wall Street Journal, "Six Books to Curl Up With This Winter"
"Creepy, disquieting and unsettling, this book grabs the reader right away. "—TimeOut New York, "15 Best Books of 2016"
"Hunt’s back with a modern gothic starring a scam-artist orphan who claims to talk to the dead; his sister who ages into a strange, silent woman; and, later, her pregnant niece, who follows her aunt on a trek across New York without exactly knowing why. Also featured: meteorites, a runaway nun, a noseless man, and a healthy dash of humor. Although it’s still too early to speculate on the prize-winning potential of Mr. Splitfoot, Hunt’s fantastical writing is already drawing favorable comparisons to Kelly Link and Aimee Bender, and her elegantly structured novel promises to be the year’s most unusual ghost story. "—The Millions, "Most Anticipated: The Great 2016 Book Preview"
"Mr. Splitfoot is going to be a wild ride. If you're all about magical realists like Kelly Link, this is one title you'll need to pick up, because Samantha Hunt's third novel takes the banal and rockets it into the fantastic (and the fantastically wonderful). I don't want to divulge too much about this one because I'd rather you read it yourself, but I will say that if you love dual narrative structures or complicated timelines, this is an especially good pick for your must-read list. 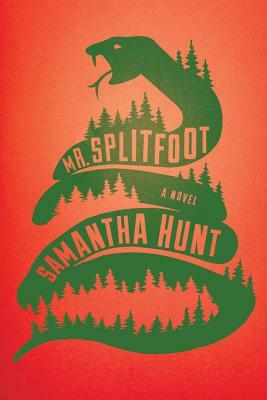 "—Bustle, "17 Of 2016’s Most Anticipated Books To Put On Your Wishlist Immediately"
"Mr. Splitfoot is an eerie and electrifying read — mixing modern and gothic, and blurring the line between the living and the dead...Even if the supernatural is not your cup of tea, the frenetic style of Mr. Splitfoot will sweep you up in the book's wildly unraveling reality. "—MPR News, "The best books of 2016 (so far)"
"The natural and supernatural quickly blur, as characters like Captain Ahab and Huck Finn pop up in this suspenseful, wryly witty novel.”—Huffington Post, "5 Hot Books"
"Fans of the wondrous and strange will find solace in Samantha Hunt’s haunting novel...Hunt's narrative drips in magical realism, so you’ll have to roll with the whimsy and supernatural elements, including Nat’s charming ability to communicate with mischievous ghosts. "—Refinery 29, "5 Terrific New Books To Read This January"
"Love dark, creepy, gothic books about orphans in group homes speaking to the dead, mysterious strangers, arduous journeys, cults, and homicidal maniacs? Who doesn’t? While I am notoriously grumpy when it comes to dual storylines, the two threads in this book, separated by time and place, were so artfully woven together and linked by such mysterious and sympathetic characters, I was hanging out on the edge of my seat anticipating what would become of them. As the plots began to converge, I was absolutely addicted. This could’ve easily been a one-sitting book. "—Andi Miller, BookRiot, "The Best Books Of 2016, So Far"
"The author of the wonderful Tesla novel, The Invention of Everything Else, is back with a contemporary gothic about orphan children who can channel the dead, a mysterious mission, and something hidden in the woods. "— BookRiot,"15 Books Out in 2016 You Should Mark Down Now: Fiction Edition"
"A supernatural road trip. "—Vanity Fair, "In Short"